I have been making a conscious effort to use my crock pot more frequently. Yesterday, I had the intention of making a delicious apple and cranberry chicken breast dinner. I knew it would be risky, but sounded like it had a lot of potential. I would have tried something safer, but really just wanted to use the bag of cranberries in my fridge (I have no idea why I bought them in the first place…) Everything was thrown into the pot right after lunch and cooked the rest of the day. Around 6pm, I started taste-testing. That’s when plans changed. It’s not that it was bad, but the chicken really didn’t absorb much of the fruity flavors like I hoped. At that point I still wasn’t quite hungry enough for dinner anyway, so I had time to come up with Plan B. What could I do that wouldn’t put this chicken to waste? Not too long later it hit me. Chicken salad. 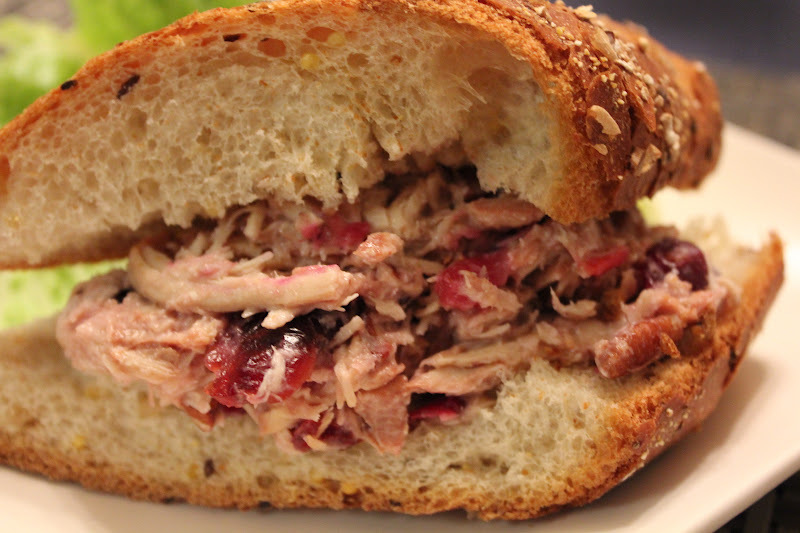 It must have been my subconscious telling me how much it missed Bull Street Gourmet’s Chicken Salad Sandwich (made with cranberries and cranberry mayo) when I chose the burger instead the other day. Using this crock pot chicken gone wrong (for its original purpose), I knew I could pull off a successful chicken salad. 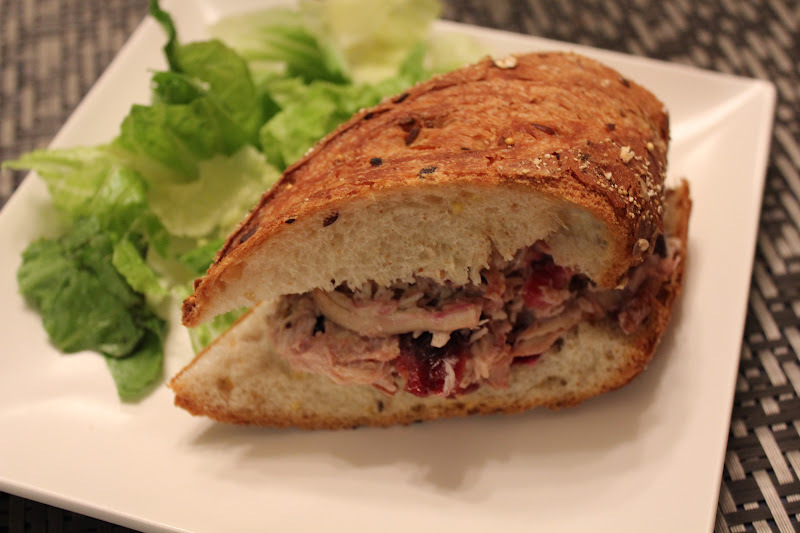 I used the last of my cranberries to make a sauce that was just what I needed to bring it all together. The result was a better-than-I-imagined sandwich. It would also be great on top of a bed of greens. This is not what I had in mind when I first turned on the crock pot, but I’m glad it worked out the way it did. The best part? It’s PINK! A pink sandwich is always a good thing. 1. To prepare the chicken, place all ingredients in crock pot and cook on low 4-6 hours. 2. While chicken is cooking, prepare cranberry sauce by adding water and sugar to a saucepan. Bring to a boil, add cranberries and return to boil. Turn heat to low. Let simmer about 10 minutes, stirring occasionally. Pour into a bowl and let cool at room temperature. Refrigerate until needed. 3. When chicken is ready, remove from pot and shred breasts in a medium bowl. 4. 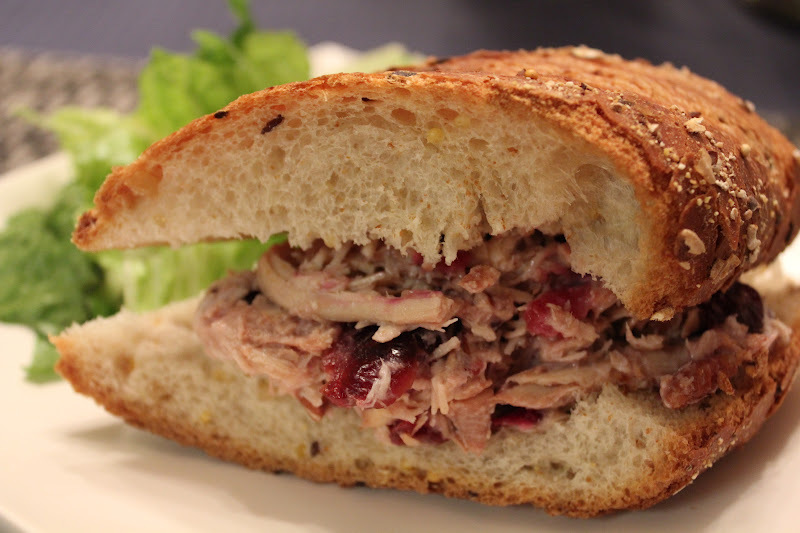 In a small bowl, combine mayo and 1/4 cup cranberry sauce. Add mixture to shredded chicken. Add Craisins and pecans. Stir until well-combined. Cover and refrigerate to chill at least 1 hour before serving. It is so versatile, healthy and just plain delicious. 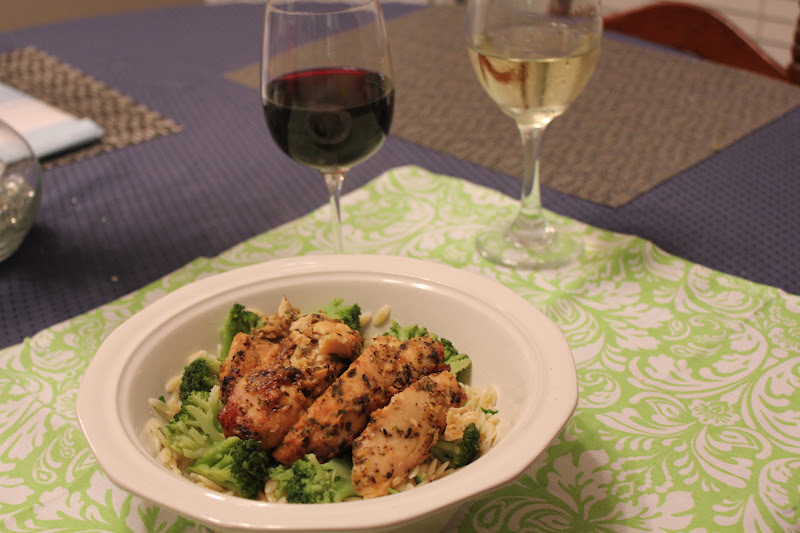 The best part about this chicken dish in particular is that it’s cooked in a crock pot. Throw it all in the pot in the morning and come home to hot and ready to eat dinner! If you’re paranoid like me, you may spend the day at work praying your house isn’t burning down because the crock pot caught on fire. But when you get home and realize it’s perfectly safe and sound, AND the chicken looks like it does in these pictures, you may just jump for joy…literally. 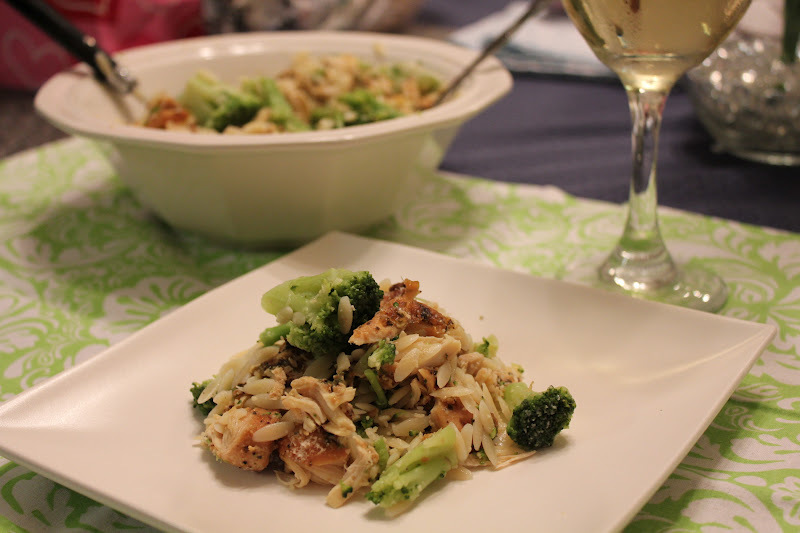 The recipe calls for white wine, so I thought drinking a white wine along with the dish would compliment it well. But I love red wine too much so poured a glass of that as well. I took a sip of the white, but ended up drinking the red while Greg enjoyed the white. Fine with me. I really need to start using my crock pot more often. It is just too easy that I really don’t have an excuse not to. 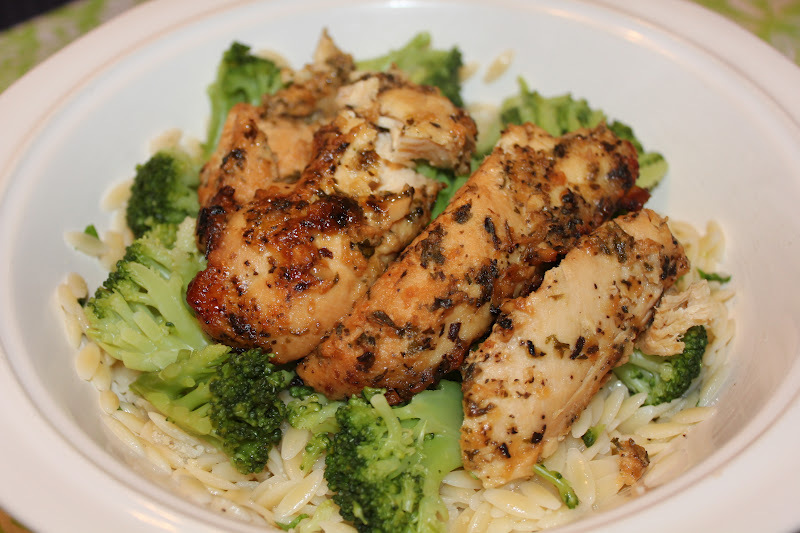 Find the recipe for Jessica’s Crock Pot Parmesan Chicken here. I halved the recipe and used broccoli as my vegetable of choice. It was the perfect amount for Greg and I, plus a small serving left over for lunch the next day. Today my chicken-loving self will have to go without chicken, or any meat for that matter, because of Ash Wednesday and the start of Lent. Last year, I gave up meat altogether. It was tough, and I craved burgers more than anything. This year, I’ll be doing something different for Lent so I’ll only be a vegetarian on Fridays. That leaves six other days each week to cook some meaty recipes in the crock pot. I better get cookin’!